G.E. Smith And His Telecaster Lead Me Astray . . .	Four Cents Is Four Cents! 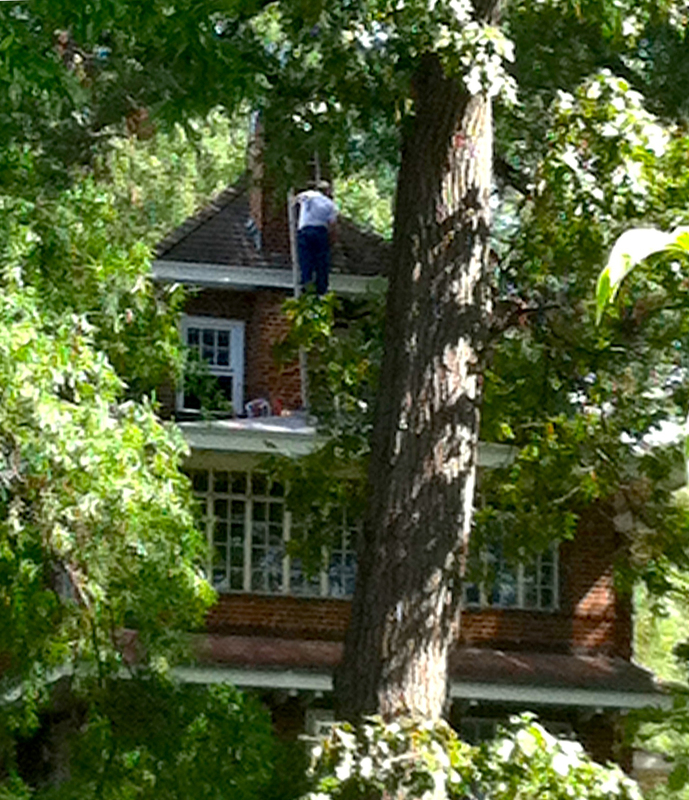 The gentleman across the street from us is a great guy and, as you will see, a brave one as well. He’s probably in his 70s, but he thinks nothing of putting a ladder on the second-story roof overhang of his house to do some repair or maintenance on the third story or even, as seen here this morning, the roof above the third story. I have a fear of heights and it frankly gives me the willies to see John doing that! I salute his courage as I cringe at the thought of what could happen to him if all did not go as he had planned. John’s house is the former home of T. Howard Duckett, who was one of the founders of the Washington (DC) Suburban Sanitary Commission, which handles the water and sewerage for much of the DC area. It’s a lovely house sitting in the middle of six city lots. Duckett, who evidently was a very good business person, put up the five Sears kit homes across the street from his house as rental properties in the mid-1920s. My house is the middle one of the five. On the next street south of us is the old and vacant original WSSC building. After the WSSC moved to new quarters, the city gained ownership of the property and has struggled for years with what to do with the huge building. From time to time, we hear it will soon be a retirement home or an arts center or a school but what it has been for the nine years I’ve lived here is a big vacant building. So political inertia is a powerful force and so, Neighbor John, is gravity. May it always remain your friend as you perform these home-repair duties.